Fate: sunk as a target during exercise RIMPAC 2008 (SINKEX) near the island of Kauai, HI. Frederick Joseph Home was born 14 February 1880 in New York, N.Y., and entered the Naval Academy in 1895. As a Naval Cadet, he saw service during the Spanish-American War in Bancroft and Texas, before graduating in 1899. Subsequently, he sailed in various ships during the Philippine Insurrection, served as an instructor at the Naval Academy in 1905, and filled various posts ashore and afloat until taking his first command in 1914, Rainbow. Home rendered distinguished service as Naval Attache at Tokyo 1915 to 1919, and until World War II exercised command of many ships and shore installations. In 1941 he was a Vice Admiral serving on the General Board of the Navy Department, and in March 1942 he was appointed Vice Chief of Naval Operations. 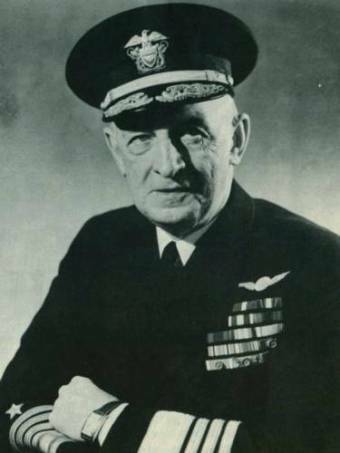 From 1942 until 1945 Admiral Home had particular cognizance over matters of logistics, intelligence, and communications, and was awarded the Distinguished Service Medal for his outstanding service. He retired 1 August 1946, after over 50 years of active duty with the Navy. Admiral Home died in San Diego, Calif., 18 October 1959. USS Horne (DLG/CG-30) was a Belknap-class destroyer leader / cruiser. 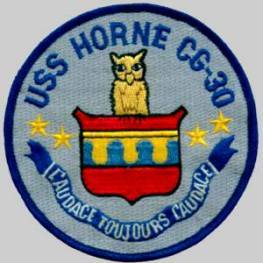 Named for Admiral Frederick J. Horne, 1880-1959. 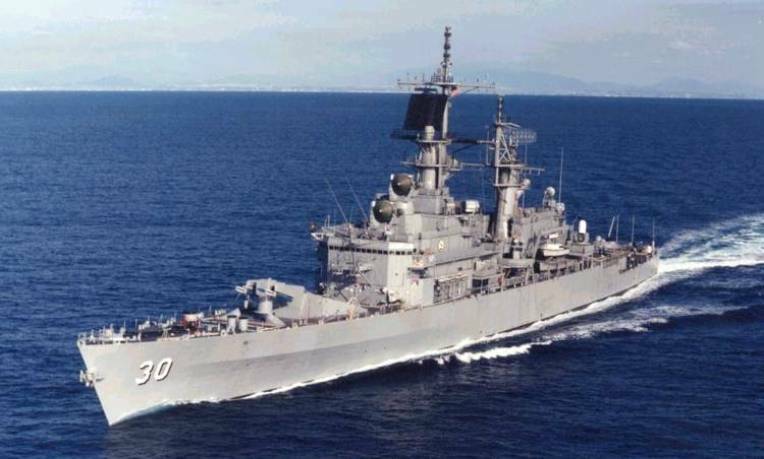 She was launched as DLG-30, a frigate, and reclassified Cruiser on 30 June 1975. The contract to construct Horne was awarded on 20 September 1961. Her keel was laid down at San Francisco Naval Shipyard on 12 December 1962. Launched 30 October 1964 and sponsored by Mrs. Frederick Horne, widow of Admiral Frederick J. Horne. 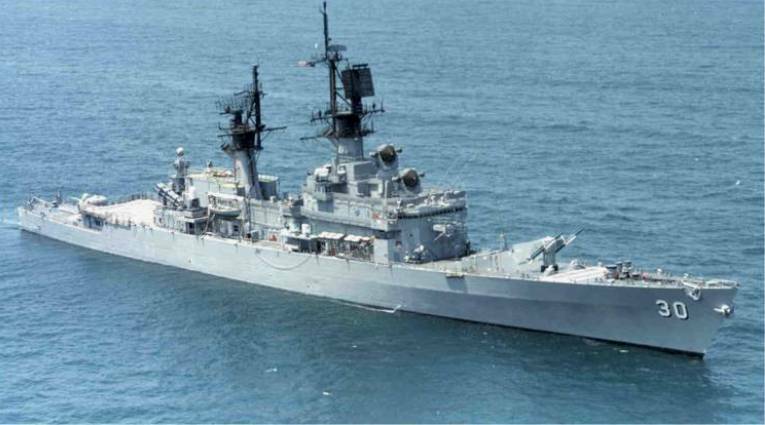 Delivered 7 July 1967 and commissioned on 15 April 1967. 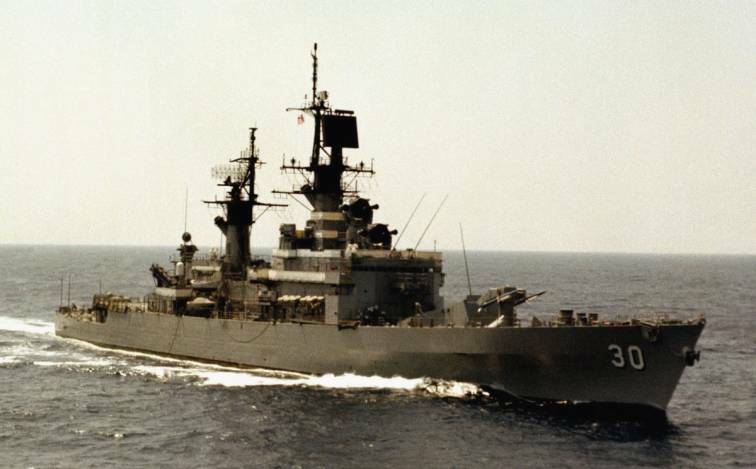 On July 20, 1983 the New York Times reported that the Horne along with seven other vessels in the Carrier Ranger Battle Group left San Diego on Friday July 15, 1983 and were headed for the western Pacific when they were rerouted and ordered to steam for Central America to conduct training and flight operations in areas off the coasts of Nicaragua, El Salvador and Honduras as part of major military exercises planned for that summer. Besides the Ranger, the battle group is composed of the carrier Ranger, the cruiser Horne, the guided missile destroyer Lynde McCormick, the destroyers Fletcher and Fife, the frigate Marvin Shields, the oiler Wichita and the support ship Camden. 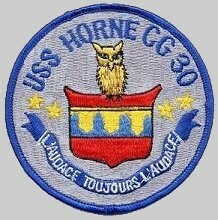 After more than 26 years of service, Horne was decommissioned on 4 February 1994. 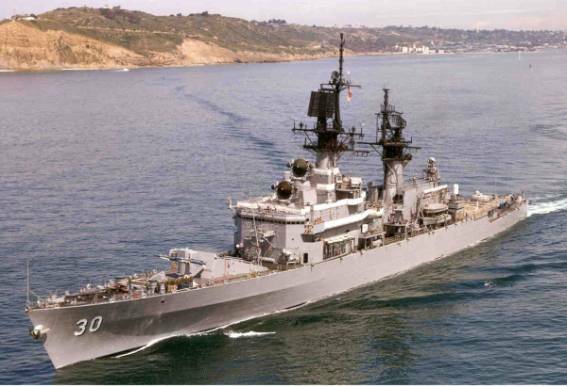 She was struck the same day, transferred to the United States Maritime Administration and was laid up at the Suisun Bay National Defense Reserve Fleet. Initially scheduled to be scrapped, she was spared the breakers torch and is now scheduled to be sunk as a target as part of a multi-national naval exercise off Hawaii. ex USS Horne was sunk as a target during the exercise RIMPAC 2008 north of the Island of Kauai, Hawaii - July 14, 2008. 3 AGM-84 ‘Harpoon’ missiles were fired from aircraft of Carrier Air Wing 5 (CVW-5). Final location: N22.55.00 - W159.55.00 / depth: 2,575 fathoms.